Congenital factor XIII (FXIII) deficiency, originally recognized by Duckert in 1960, is a rare autosomal recessive disease usually associated with a severe bleeding diathesis. Although acquired factor XIII deficiency has been described in association with chronic conditions such as hepatic failure, inflammatory bowel disease, and myeloid leukemia, the only significant cause for bleeding in children is an inherited deficiency. Factor XIII is a plasma transglutaminase that catalyzes the final step in the coagulation cascade, cross-linking the loose fibrin polymer into a highly organized structure. In addition, factor XIII covalently binds fibronectin, a2 -plasmin inhibitor, and collagen to the fibrin plug; this enhances adherence to the wound site, resistance to fibrinolysis, and wound healing by providing a scaffold for fibroblast migration and proliferation. Fibrin-fibronectin cross-linking is necessary to support the formation of the cytotrophoblastic shell at the site of placental implantation, which accounts for the role of factor XIII in the maintenance of pregnancy. The factor XIII zymogen circulates in plasma as a tetramer composed of 2 catalytic A subunits and 2 carrier B subunits (A2 B2). The A subunits are synthesized in megakaryocytes and monocyte precursors in the bone marrow and placenta; A2 dimers are present in circulating platelets and monocytes. The B subunits are synthesized in hepatocytes. The A2 and B2 dimers assemble in the plasma to form a heterotetramer, which has a long plasma half-life of 7-12 days. Activation of the zymogen to factor XIIIa depends on limited thrombin cleavage of the A subunits followed by calcium-dependent dissociation of the B subunits, exposing the A subunit active site (as shown in the image below). 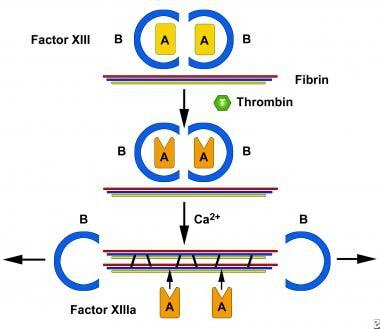 Activation of factor XIII (FXIII) by thrombin and calcium is a 2-step process. Thrombin cleaves an arginine-lysine bond in the A subunit and calcium causes dissociation of the B subunit, exposing the active site on the A subunit (XIIIa). Factor XIIIa catalyzes the formation of covalent bonds between glutamine and lysine residues on the fibrin a and g chains, enhancing the mechanical strength of the fibrinpolymer. Inherited factor XIII deficiency is usually due to mutations in the gene encoding the catalytic A subunit, located on chromosome 6. More than 40 different mutations have been identified, half of which are missense mutations. In patients homozygous for this defect, the A subunit is absent in plasma, platelets, and monocytes, resulting in a severe bleeding diathesis; the concentration of B subunits is relatively normal. The impaired cross-linking of extracellular matrix proteins at sites of wound healing or placental implantation can lead to abnormalities in these processes, resulting in abnormal or delayed healing and spontaneous abortion. Mutations have also been found in the gene encoding the B subunit, located on chromosome 1; however, this has been reported in only 5 families to date. With the absence of the carrier B subunits, the plasma half-life of the A subunits is shorter (ie, 3 d), resulting in decreased plasma levels of both A and B. However, because of the presence of A subunits in platelets and monocytes, the phenotype is less severe. The prevalence of factor XIII deficiency is about 1 case per 2 million in the general population. Worldwide, the prevalence is highest in the Sistan and Baluchistan province of Iran. In addition to Iran, population-specific mutations due to founder effects have been reported in Pakistan, India, Tunisia, and Finland. The mortality and morbidity are primarily related to bleeding; intracranial hemorrhage can be life threatening. The spontaneous abortion rate in women with severe factor XIII deficiency approaches 80%. This is an autosomal recessive disease; the male-to-female ratio is 1:1. Because the clinical bleeding is severe in most patients with hereditary factor XIII deficiency, the diagnosis is made at an early age, often during infancy. Dickneite G, Herwald H, Korte W, Allanore Y, Denton CP, Matucci Cerinic M. Coagulation factor XIII: a multifunctional transglutaminase with clinical potential in a range of conditions. Thromb Haemost. 2015 Apr. 113 (4):686-97. [Medline]. [Full Text]. Karimi M, Bereczky Z, Cohan N, Muszbek L. Factor XIII Deficiency. Semin Thromb Hemost. 2009 Jun. 35(4):426-38. [Medline]. Naderi M, Alizadeh S, Kazemi A, et al. Central nervous system bleeding in pediatric patients with factor XIII deficiency: a study on 23 new cases. Hematology. 2015 Mar. 20 (2):112-8. [Medline]. Gebhart J, Hofer S, Panzer S, et al. High proportion of patients with bleeding of unknown cause in persons with a mild-to-moderate bleeding tendency: results from the Vienna Bleeding Biobank (VIBB). Haemophilia. 2018 May. 24 (3):405-13. [Medline]. Anwar R, Minford A, Gallivan L, Trinh CH, Markham AF. Delayed umbilical bleeding--a presenting feature for factor XIII deficiency: clinical features, genetics, and management. Pediatrics. 2002 Feb. 109(2):E32. [Medline]. Karimi M, Peyvandi F, Naderi M, Shapiro A. Factor XIII deficiency diagnosis: challenges and tools. Int J Lab Hematol. 2018 Feb. 40 (1):3-11. [Medline]. [Full Text]. Inbal A, Oldenburg J, Carcao M, Rosholm A, Tehranchi R, Nugent D. Recombinant factor XIII: a safe and novel treatment for congenital factor XIII deficiency. Blood. 2012 May 31. 119(22):5111-7. [Medline]. Fadoo Z, Merchant Q, Rehman KA. New developments in the management of congenital Factor XIII deficiency. J Blood Med. 2013. 4:65-73. [Medline]. [Full Text]. Naderi M, Eshghi P, Cohan N, Miri-Moghaddam E, Yaghmaee M, Karimi M. Successful delivery in patients with FXIII deficiency receiving prophylaxis: report of 17 cases in Iran. Haemophilia. 2012 Sep. 18(5):773-6. [Medline]. Fahlbusch FB, Heinlein T, Rauh M, et al. Influence of factor XIII activity on post-operative transfusion in congenital cardiac surgery-A retrospective analysis. PLoS One. 2018. 13 (7):e0199240. [Medline]. [Full Text].